This weekend, I gathered with some buddies in a wood-panelled apartment for a fondue party. The theme, Après Ski, seemed fitting for a cold winter night in an apartment with a wood stove, loft bedroom and, again, wood panelling. We all put on our finest heavy sweaters, got out our fattiest foods and stuffed ourselves. Fondue was the feature of the night. 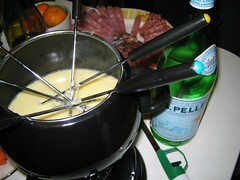 When I was younger, I thought that fondue was the epitome of style and sophistication. Geja's Cafe, in Chicago, put any other upscale dining to shame. I also have vague recollections of making "pizza fondue" in a cooking class I took in 4th grade. At any rate, I've always had a special place in my heart for fondue, as do, I'm sure, most people with parents who got married in the Seventies...I think my parents have at least three fondue sets in the basement. Not that we ever used the fondue sets and yet my mother was entirely unwilling to part with even one last time I asked. How could I not romanticize something that she never uses yet clings so dearly to? I scored with the fondue, finding a "fondue cheese kit" at the grocery store that mixed emmentaler and gruyere with truffle oil. Along with the fondue, we had a charcuterie plate, a vegetable plate, roasted garlic and the piece de resistance, puppy chow. where fondue brought a little Seventies style class to the evening, the puppy chow brought a little Midwestern flair. Made with Rice Chex, chocolate, peanut butter, butter and powdered sugar, it's best served in a ziplock bag except that the bag hinders access by more than one person at a time, hence our decision to use the bowl. It is impossible to stop eating puppy chow, or "Muddy Buddies", as they like to call it at Chex.com. I know, you're looking at the picture and thinking, "No way. That stuff looks nasty. One bite maybe, just to be friendly, but that's it. I'd much rather enjoy a homemade cream puff and some cheese fondue." but you are so so wrong. anyways, i could go on, but you have the recipe...try it out. especially if you live somewhere cold. i promise you won't be disappointed. Puppy Chow is an awesome snack messy to make but the ending results make the mess worth all the while! One word to decribe Puppy Chow is YUMMY!